When George Soros “broke the Bank of England,” famously earning him $1.1 billion on a single trade, it was not only the Bank of England who was rocked by losses. Some ambitious and formerly successful traders had bet against Soros – traders such as Bob. Some background: In 1990 the Britain's Thatcher government decided to join the European Exchange Rate Mechanism (ERM). The ERM was a system to reduce exchange-rate variability. With U.K. inflation at three times the rate of Germany's and interest rates at 15 percent, the conditions for remaining the ERM were not favorable. Due to its inherent impossibility, as well as short-selling by an international group of currency speculators led by George Soros, the UK was forced to withdraw from the ERM on September 16, 1992 ("Black Wednesday"). Soros' trade was virtually guaranteed to be successful due to the large interest rate differentials between the U.K. and Germany. Not all central bankers learned the lesson - Soros and others profited from similar trades put on before the Asian Currency Crisis of 1997. As a floor trader during the late 1980s and early 1990s in Chicago, Bob was considered one of the best traders in the commodity pits. But Bob was bothered by something. Being among the best commodity traders in Chicago wasn't enough. He resented that he wasn't yet recognized as one of the world's top traders. Bob came from a family of traders, and success came easily for him. So easily that he often stayed out late after work - drinking heavily and playing poker with the guys. When he first got wind of Soros' big bet against the British Pound, Bob was envious. Here was a world-renowned trader taking on a central bank. The gall of that proposition bothered Bob. It didn't matter whether Soros' reasoning was sound. Bob resented that another trader, one widely considered one of the best in the world, was doing something so big and bold. Bob thought, "I'm a great trader," and then a light bulb lit up - this was his chance to beat Soros at his own game and gain global fame. 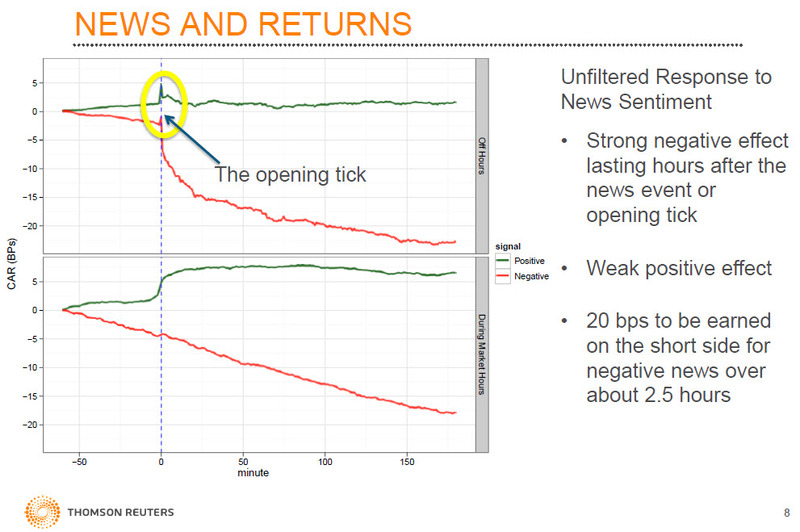 Bob began placing large bets that the Pound peg would hold, and he developed a thesis about why this was a good idea after he had started placing the bets. As the peg held, the stress of the position nonetheless began to wear on him as more and more orders against the ERM peg - challenging the Bank of England - flowed into the Chicago pits. As if to bolster his own courage, he doubled the size of his bet, effectively calling this one trade as the make-or-break point of his career. On September 16, 1992, Britain abandoned its adherence to the ERM, and Bob lost his entire net worth, his reputation, and his career. Bob didn't take responsibility for the loss for several days. Instead he blamed the Bank of England. He sold his seat on the exchange to pay off debts but still did not have enough collateral. Bob rapidly spent down his minimal savings, and his alcohol habit picked up. In September of 1993 he declared bankruptcy. Bob was hitting bottom - his behavior was erratic, he had lost all of his significant relationships. He was alone, depressed, resentful, alcoholic, and entertaining thoughts of suicide. Personal resentment is a lot like institutional resentment and mistrust, and both are common among Americans scarred by the financial crisis. While the U.S. equity markets have rallied significantly this year, we're seeing investor money continuing to flow out of equities. 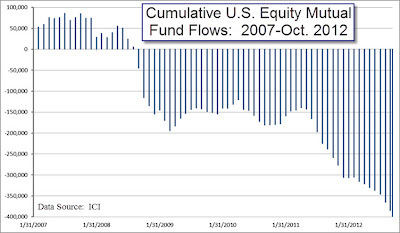 The image below displays the cumulative outflows of investor money from domestic and global equity mutual funds based in the U.S. through mid-October 2012. 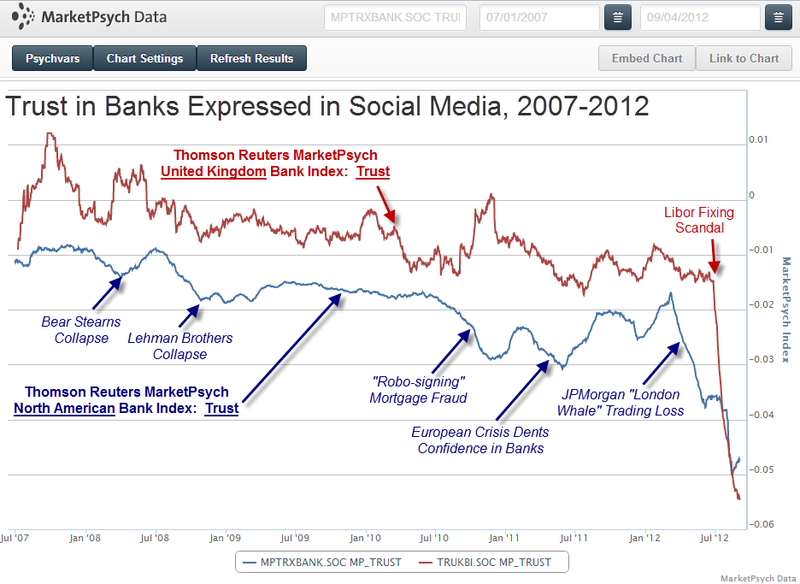 At MarketPsych Data we monitor trust expressed in various institutions, and our data show very low levels of trust in conversations about the financial industry. 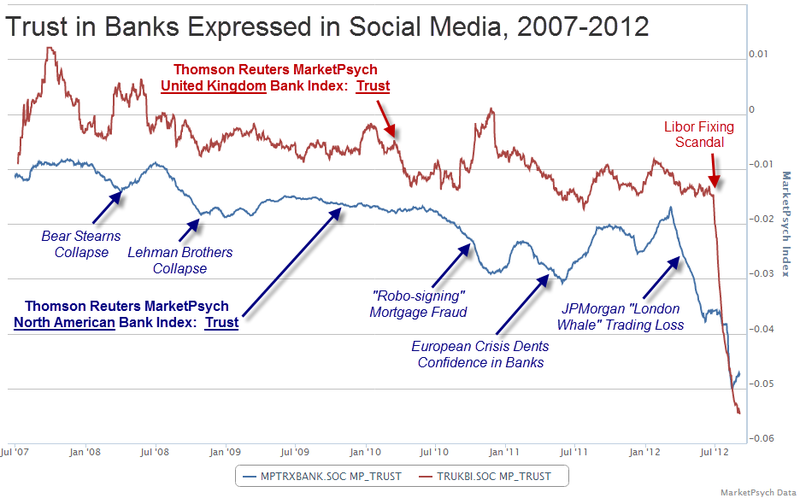 See the chart below for the long-term trust trend in our Thomson Reuters MarketPsych Bank index Trust data for both the U.S. and the U.K. You can see the gradual downward trend in trust since 2007 and that the Libor-fixing scandal sent trust in banks to all-time lows. 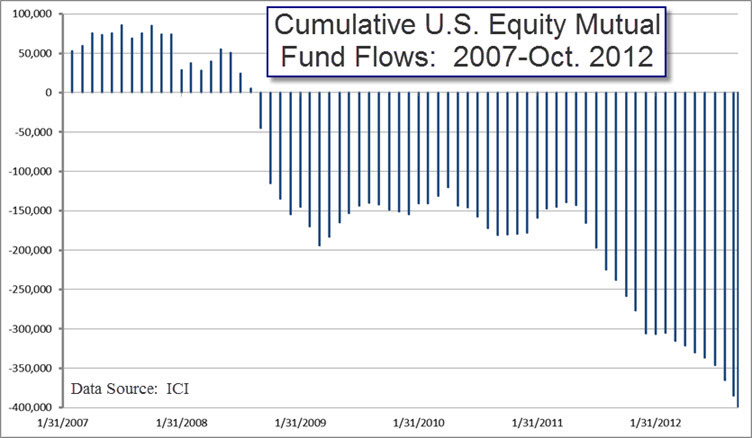 Fund outflows intensify during periods of declining trust, especially in 2012. Ironically, it is investing sharks (recalling last week’s newsletter) who don’t get hung up on the inequities in the system, rather they study it for what it is and look for advantages in the new order. But most of us are not sharks, and we have emotional systems linked into our memories and feelings of mistrust. Performance slumps – like mistrust and resentment - are a type of emotional rut that we can fall into and have a challenging time climbing out of. I heard Bob’s story after speaking about financial psychology at a technology conference. He pulled me aside after my talk. As he shared his story with me, I didn’t find his fall the most moving episode - it was the story of his redemption that struck me. Bob methodically rebuilt his reputation and social network in the years following hitting bottom. Bob is today a very successful technology executive who has been sober for more than 15 years. How did Bob implode his trading account, lose all his social support, destroy his reputation, become addicted to alcohol, hate the world, contemplate suicide, and ultimately recover? The secret to Bob’s recovery lies in the method that any of us – including nations – can use to get out of a slump. 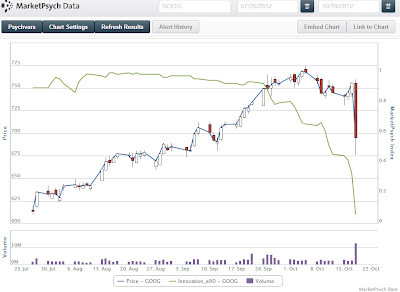 In our short-term quantitative models we’re seeing a one week short signal on Apple (AAPL) – we have seen shorts on Apple for quite a few prior days as well due to disappointment about no new path-breaking products and increasing competition. 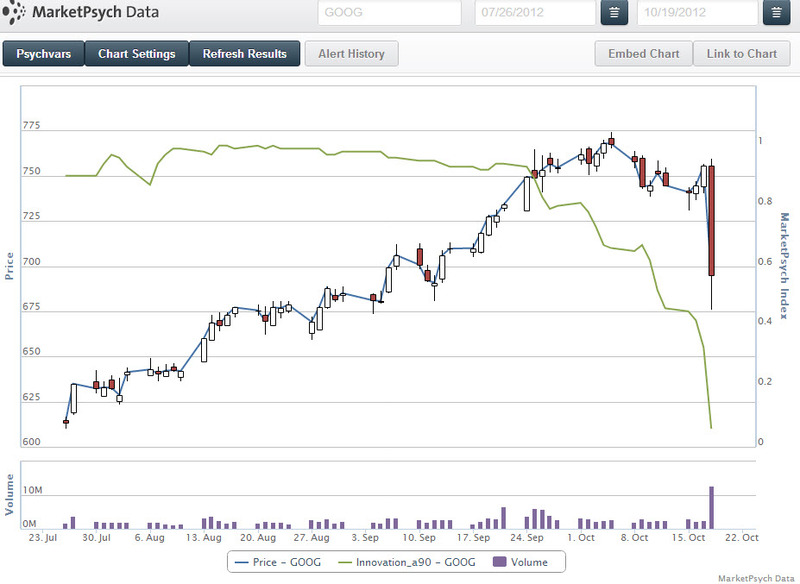 We also see a “buy-the-disaster” one-week long on Advanced Micro Devices (AMD). Also seeing a mild one-week long on the S&P 500, indicating the market is slightly oversold. (See Disclaimer below). 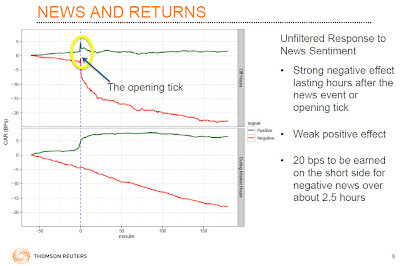 It has been a busy few weeks as we launch the Thomson Reuters MarketPsych Indices for monitoring market psychology. Please let us know if you’d like more information. In the next month we will be speaking in New York, attending the Sentiment Analysis Symposium in San Francisco, and our Chief Data Scientist, Aleksander Fafula, is speaking at Predictive Analytics World in London. We hope you found the letter this week interesting and useful! Another day, another fraud accusation at a major bank. Makes me want to put all my savings in bitcoin. 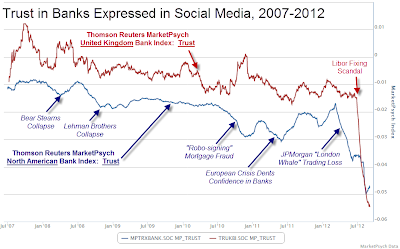 Here is a graphic depicting the declining trust in the U.S. financials sector since 2000. Note that it is relentlessly dropping. 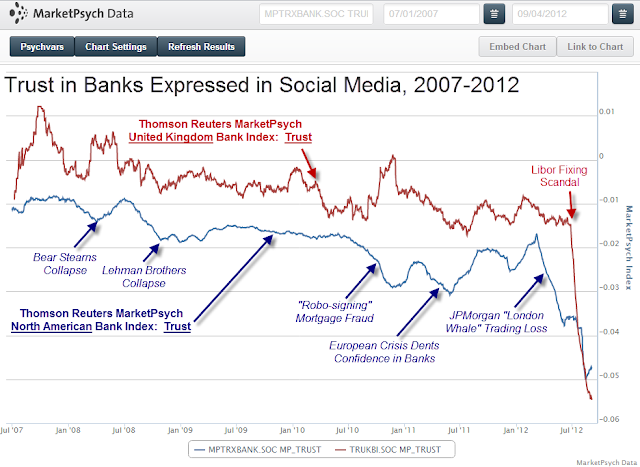 Here's a chart of the declining confidence in US and UK banks based on a textual analysis of social media (from marketpsychdata). Looks like the financial crisis was just the beginning of the damage to banks' reputations. This declining confidence bodes well for hard assets (real estate, gold, bitcoin, etc...). But it does not bode well for the financial system.